Next summer, my daughter will be joining a dear friend on a mission trip. I’ve loved hearing my friend share about her adoptions of three children from Ukraine as well as her continued ways of ministering to Ukrainians. She invited Heather to join her for a sewing camp. They have set up a business with some of the girls. Heather bought me a bag that they made for Christmas and I love using it; I’m also reminded to pray for them each time I hold it. 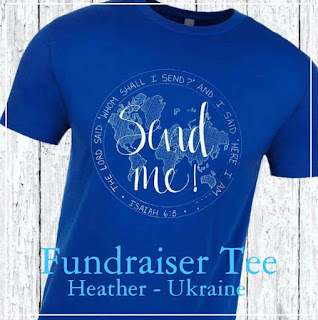 In preparation for this, Heather is partnering with Grace & Cotton in a T-shirt campaign. With input from Heather, they designed a shirt featuring Isaiah 6:8. Heather shared about it here. They are only available through January 31st.